Salaried employees are sometimes exempt from state and federal laws regarding labor. Illinois follows federal standards when determining who is eligible for overtime, minimum wage, and other automatic employee benefits. Most salaried employees are eligible. In Illinois, a salaried worker is a person who receives a fixed amount of income each pay period regardless of how many hours worked or the quality of the work. This differs from hourly workers, who log their hours and are paid for the amount of time they work, and commissioned workers such as salespeople, who are paid a percentage of each order they bring into a business. Salaried workers in Illinois are entitled to worker's compensation if they are injured in the course of performing job duties. Worker's compensation entitles them to medical care following an injury as well as cash benefits if they cannot work for more than seven days. The cash benefit is equivalent to two-thirds of the worker's average weekly wages. This is easier to calculate for salaried workers, since they receive the same wages every week. Salary workers may be entitled to overtime pay in Illinois. Illinois law does not exempt people from this requirement based upon how they are paid but upon the type of job they hold. Professionals and executives are exempt from overtime pay. 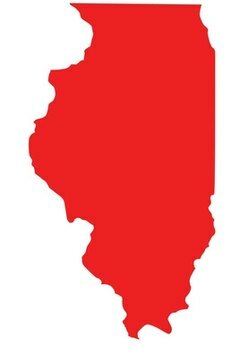 Illinois determines executive or professional status based on federal standards. Executives must make more than $455 per week, manage or supervise a business or department (including at least two other employees) and have the authority to hire and fire personnel. Professionals have the same salary requirements but work in a field that requires advanced knowledge or creative skill, regardless of supervisory duties. The minimum wage in Illinois is $8 per hour. Strictly speaking, salaried employees are not entitled to minimum wage since they are not paid by the hour. However, all salaried employees except those exempt from overtime requirements are also entitled to minimum wage requirements. Salaried employees can determine if they are being paid in accordance with minimum wage laws by dividing their total salary per week by the average number of hours they work each week. Illinois law requires that all workers receive at least a 20-minute break after working 5 hours. Whether the worker is salaried or paid hourly is irrelevant to this requirement. Hourly employees are paid for breaks lasting 20 minutes or less. The payment requirement does not apply to salaried workers as they are not paid by the hour. Ori, Jack. "Illinois Employment Laws for Salaried Workers." , https://legalbeagle.com/6683193-illinois-employment-laws-salaried-workers.html. Accessed 21 April 2019.